Sanchez called out Comedy Central host Jon Stewart as a "bigot" for mocking him, and complained that Jews -- like Stewart -- don't face discrimination. He also suggested that CNN, and perhaps the media industry more broadly, is run by Jews and elitists who look down on Hispanics like himself. Clearly, those comments didn't sit well with the network, which put out a terse statement around 6 p.m. Friday. "Rick Sanchez is no longer with the company," the CNN statement read. "We thank Rick for his years of service and we wish him well." So far, Sanchez hasn't spoken out about the explosive interview Thursday on "Stand Up! with Pete Dominick." On the radio show, the now-former CNN star didn't just make a single impolitic statement, but spoke at length -- for roughly 20 minutes -- about Stewart and a media world he believes to be filled with "elite Northeast liberals" that consider Hispanic journalists "second-tier." Sanchez is a Cuban-American. He specifically called out Stewart as someone with "a white liberal establishment point-of-view" and "can't relate to a guy like me." Also, Sanchez claimed that Stewart is "upset that someone of my ilk is at, almost, his level." Sanchez also hasn't even addressed the controversy on Twitter, where he is a frequent user. He even made the social media platform a signature part of his afternoon show, "Rick's List." Sanchez didn't appear on his 3 p.m. show on Friday, but CNN's public relations department put out word that he was going to be at a book signing at the CNN Center in Atlanta. It's unclear whether he attended it. Sanchez joined CNN in 2004 after working as a anchor in Miami. Prior to that, Sanchez worked as a correspondent at MSNBC, providing breaking news updates at CNBC, and at other local stations. 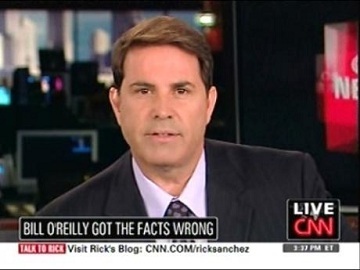 CNN plans to air "CNN Newsroom" in the "Rick's List" timeslot on weekdays from 3-5 p.m.